While flowers win the hearts and minds of many container gardeners, foliage plants can be beautiful, interesting, and easy to grow. Here are our favorites. There is something about colocasias, also known as elephant ears, that can be moving. They are graceful, elegant, and often huge foliage plants. Great for large pots, they grow in partial shade and come in an enormous range of leaf shape, size, and color. They like moist, warm conditions but need to be kept sheltered from high winds. They can also be grown indoors in bright, indirect, or filtered light. Design Tip: Grow colocasias in large pots. Plant a medium height plant around them, such as fuchsias, coral bells or coleus. 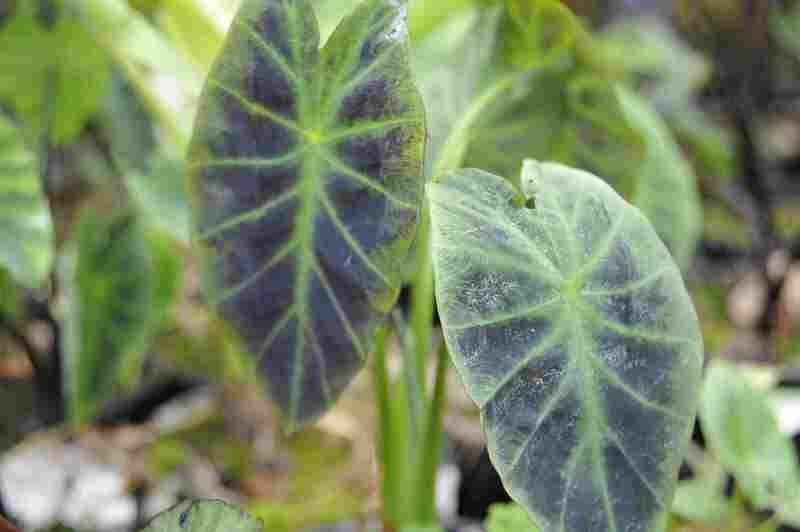 Plant draping plants around the edges of your pot, such as creeping Jenny, ivy, or sweet potato vine. While heuchera, also known as coral bells, does send up flower spikes, and they can be beautiful and great cut flowers, it is mainly an amazing foliage plant, hard to kill, very adaptable to different light levels, and is drought tolerant. Heuchera comes in a wide range of leaf shapes and a fabulous array of colors, from dusky browns and grays to pinks and lime greens. Most form an attractive mound and will keep their form without being pruned. Design Tip: To show off the shape and colors of these spectacular plants, place heucheras alone in a pot that is the same size as the plant or smaller. Also, use it as a filler plant in a large mixed container. Hostas are notoriously beloved by deer, which is a great reason to grow them in containers where they are easier to protect. Hostas are just lusciously leafy. They come in many sizes, leaf shapes, and in colors from lime green to blue-green, with yellows in between. Some are striped and some are solid. Hostas are known as a shade plant, but some will tolerate sun. Hostas are also perennial in zones 3 to 8. If you live in a cold climate and choose a pot that is tough enough to last all winter outside, you can leave your hosta potted up. There are some plants you want to have every year, and for me, Persian shield, Strobilanthes dyerianus, is one of them. They are flat out stunning, easy to grow and care for, and look good in many different container styles. The purple and black leaves of Persian shields are show stoppers--almost iridescent. Too much sun and the leaves will bleach out, too little sun and the plant might get leggy. Mine have grown in part sun very successfully. To keep the plant full and well-shaped, pinch it back during the growing season. If you live in an area colder than zone 9 (though in zone 7 and 8, some people let it die back in the winter and it comes back in the spring), bring the plant in over winter. Place it in a bright spot, out of direct sun. Keep Persian shield moist. Do not let the soil dry out. It's easy to propagate Persian shield by cuttings, either by rooting in water or in soil. Any list of foliage plants has to include coleus. There are so many varieties with different leaf shapes, colors, and sizes that the choices are overwhelming. From browns to reds to vibrant pinks and greens, this is a plant that pretty much covers the color spectrum. Leaf shapes go from simple to complex. Mixing different varieties of coleus can make a stunning display. Keeping them pinched back so they stay bushy rather than leggy is important. Also, cut off any flowers. Most coleus prefer shade over partial shade, and, if you live in a cold climate, can be overwintered indoors. Chard and kale are two excellent examples of container plants that are not only beautiful but edible as well. Both are super easy to grow and can add both color and texture to mixed container gardens. Dinosaur kale is a fabulous blue color and can add both texture and personality to a mixed container. Redboar kale is a ruffled leaf and goes from magenta to dark purple. Both kale and chard last well into winter and are even said to taste sweeter after a frost. Ornamental kales and cabbages are sold in nurseries in the fall and they are beautiful as well, though they are seasonal and, while they are edible, are not known to taste particularly good. Herbs add color, texture and many add fragrance when touched. Many are easy to grow and it is great to nibble them when watering your gardens. Purple sage, golden oregano, curly parsley, and rosemary are all as easy to grow as they are beautiful. Plant them in pots alone, in mixed containers, or make themed herb gardens, like a pizza garden, herbs of Provence garden, or a salsa garden. Ferns are a never-ending source of amazement to me. Each has a different personality, yet all are graceful and lithe. There are thousands of different ferns to choose from. Some of my favorites are foxtail ferns and Japanese painted ferns, which come in purples and oranges. Ferns can be easy to grow and, while some only thrive in shade, some will tolerate sun. In cold climates, bring them inside where they can be happily domesticated as houseplants. Keep them in a warm, humid environment with indirect light and moist, not wet, soil.